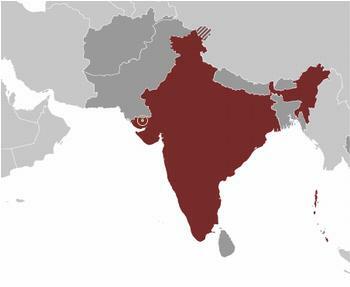 MANILA, Philippines, September 14, 2011 (ENS) – The Asian Development Bank has approved a US$100 million loan to the state of Gujarat in western India to accelerate the rollout of one the world’s largest solar power facilities. The funding for the Gujarat Solar Power Transmission Project will support the 500 megawatt Patan Solar Park, Asia’s largest such project, located at Charanka village about 60 km (40 miles) from India’s border with Pakistan. The funds will be used to build a substation, smart grid transmission lines and other equipment to collect and distribute solar power from this remote arid area, which can expect sunshine 330 days a year. Once transmission lines and substation are installed, private companies will find it more cost-effect to set up large-scale solar energy generating plants at Charanka, bank officials say. “By putting in reliable power transmission facilities in the solar park, Asian Development Bank will help draw in private sector developers, while providing a model which can be replicated to scale up solar power in a significant manner in India,” said Naoki Sakai, senior climate change specialist with the bank. Japanese multi-national corporations Sharp, Panasonic, Mitsui and the Toshiba Mitsubishi-Electric Industrial Systems Corp., the Swiss corporation Oerlikon and Germany’s Schott Solar have “evinced interest” in setting up units in the park, according to the Office of Gujarat Chief Minister Narendra Modi. Charanka is one of several large scale solar energy parks that Gujarat plans to build to meet rising demand for power in the state and to help reduce its use of fossil fuels. The parks will provide developers with the necessary permits and services to fast track the rollout of solar generating stations. They will also help the government of India realize its goal of building solar facilities with total generating capacity of 20,000 megawatts by 2022. Along with physical infrastructure, the project will provide vocational skills training for up to 300 people in target areas, with 30 percent of them women, as well as energy-based livelihood programs for up to 100 poor women. The loan from ordinary capital resources will have a 25-year term, with a five-year grace period. The government of Gujarat will provide matching funds of nearly $37 million for the transmission project, for a total project cost of almost $137 million. 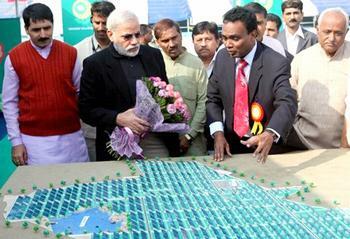 The Gujarat Energy Transmission Corporation and the government of Gujarat will jointly execute the project. The Gujarat government has agreed to purchase 933 megawatts of power from Charanka. The U.S.-based Clinton Foundation, headed by former President Bill Clinton, is partnering with the Gujarat government on the solar park. The Clinton Climate Initiative helped to select the site. “The CCI in its report for setting up the park at the north Gujarat site found that, at 5.6, solar irradiation here is highest in the country. Rajasthan has a comparable advantage, but its dusty climate discouraged CCI,” said an official in the Office of the Chief Minister. Modi said that the heat where Charanka is located has been considered a bane, but that same heat will become a mint for the area once the solar park is generating electricity. He said that in the past no one was willing to even visit the remote area, but now companies are lining up to set up projects there. “The solar park will usher in a new revolution in this area. We will ensure that the project benefits the local people,” he said. The Charanka solar park will be built on 2,000 hectares (1,000 acres) of government wasteland. In addition to solar power plants, factories making solar panels and other equipment will be located on the site. Modi has distributed letters of agreement to 14 private sector firms for generating 171 megawatts of solar energy at the park. The chief minister said that Charanka would be developed as Swarnim Surya Tirth, which translates as Golden Sun Pilgrimage. He asked the companies setting up power plants in the park to build a Sun Temple in the area, and to develop an adjacent lake, which would create jobs for local youths. Modi said, “By harnessing solar energy to generate 500 MW power, we will be able to cut carbon emissions,” as he encouraged the audience to preserve natural resources for future generations. Recently, Prime Minister Manmohan Singh announced that solar power would be a key part of his plan to deal with climate change. Currently, the largest solar power project in the world is the Ivanpah solar thermal plant in California’s Mojave Desert being developed by BrightSource, with an capacity of up to 392 megawatts of power.